One confession I have to make is that I'm pretty boring when it comes to hair styling. I can probably count on one hand the various styles I tend to rock over and over again. Now that I'm seeing some progress in length and thickness, I decided to open up my hair options to include new possibilities. At first, I thought about the down sides of taking on new styles. Particularly because sticking to similar, low manipulation styles was one way of protecting my hair. But I've shifted my thinking a bit. I now realize that my desire to experiment will only serve to reinforce my healthy hair habits. Since I'll be manipulating a little more, I vow to take on even greater precautions against breakage and elevate my hair care techniques to the next level. So here's the first hair style I'd like to share with you. My inspiration came from browsing online on a lazy Saturday when all of the sudden I saw this amazing picture. Without even thinking about it, I started plotting on how I could replicate. Since my hair wasn't freshly washed, my first thought was to load my hair with moisture. That's when I grabbed my spray bottle which contains a mix of ingredients. If memory serves me correctly, my mister blend includes spring water (no hard water minerals), some apple cider vinegar (to seal in cuticle layer), Biolage daily leave in tonic (conditioning & moisturizing) and maybe a little bit of coconut oil (protein). I may have even added some Cera Repair or another oil to the mix. There's no secret formula to this, I just add ingredients that serve a purpose in creating the results I'm looking for. While the ingredients are pretty hair healthy, my favorite aspect of this is the actual spray bottle itself. I purchased from Sally's, I think, and only paid a couple of dollars for it. But this bottle is invaluable to me. Prior to this one, I've purchased and tossed beaucoup bottles because their spray mist wasn't fine enough to meet my expectations. A fine mist is a non-negotiable for me because I need the product to spread evenly over the area and moisturize without over saturating. This allows me to mist prior to manipulation and create softness and flexibility without too much moisture. If the hair is too wet, the likelihood of breakage while styling is high. If the hair's dampness is just right, your hair moves and bends at your beckoning without fear of harm or excessive damage. What I did to create this style was pretty simple. After misting the hair and applying a bit of oil, I started to move my hair to one side using my hands. I did this until all the length of my hair was on the left side of my face. Once I was satisfied with the framework, I began braiding in one loose side braid. It took a couple of tries in order to get the look just right. I like this! I think I would have toruble braiding my own hair like this - but I think it is a great style for winter- especially when you are trying to stay warm with bulky sweaters that could rub against your hair causing too much friction. I love this look. I am such a huge fan of french braids. I wouldn't do this look at my current length, but I love how it looks on the longer lengths. I'll stick to my tucked french braid for now. Thanks for sharing. 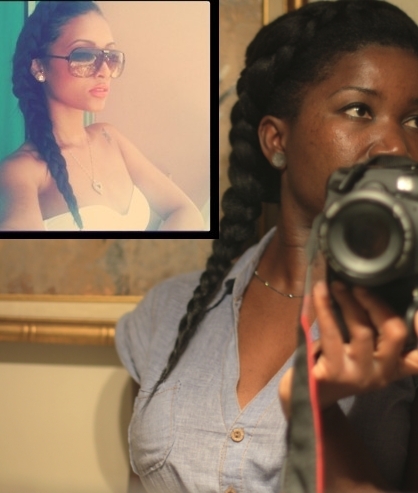 I love this style but can't braid to save my life! Would you mind doing a video tutorial? I love this look! Please do a tutorial. Very pretty! I have a picture saved at home and it's very similar, I've been meaning to try it.